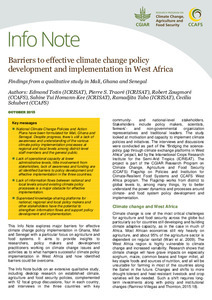 This Info Note explores major barriers for effective climate change policy implementation in Ghana, Mali and Senegal with a particular focus on agriculture and food systems. It aims to provide insights to researchers, policy makers and development practitioners working on climate change issues and activities as to what hampers successful climate policy implementation in West Africa and how identified barriers could be over-come. Totin E, Traoré SP, Zougmoré R, Homann-Kee S, Tabo R, Schubert C. 2015. Barriers to effective climate change policy development and implementation in West Africa. CCAFS Info Note. Copenhagen, Denmark: CGIAR Research Program on Climate Change, Agriculture and Food Security (CCAFS).